The Six Month Smile system is a revolutionary orthodontic treatment, which can straighten your teeth in just six months. The treatment is a quick and effective means of treating patients with orthodontic problems which affect their front teeth. 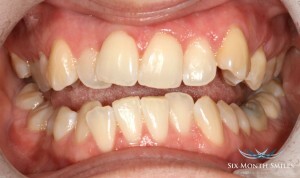 A revolutionary combination of proven orthodontic techniques, modern materials, and innovative thought -Six Month Smiles® utilizes specialized clear braces to gently straighten and align teeth in an average time of just six months. Clear brackets and white wires which are far more discreet. Less obvious than conventional braces. Cosmetic solution that fits your lifestyle. 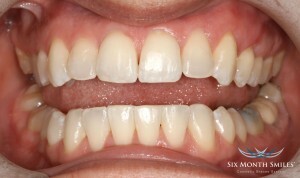 The Six Month Smile system was pioneered in the USA and has enjoyed great success. The treatment is now becoming extremely popular in the UK, as more patients seek to improve their smile in a short period of time; we are extremely pleased to now be able to offer this treatment at your Local derby dentist – Bridge Dental & Implant Clinic.